I have written some articles on what Bitcoin is all about in my previous entries, but for the sake of this entry, let me talk a little about Bitcoins so you know what is all about. Bitcoin is a payment system introduced in 2009 by a developer Satoshi Nakamoto as open-source software. The payments in the system are recorded in a public ledger using its own unit of account, which is also called bitcoin. Payments work peer-to-peer without a central repository or single administrator, and this has led the US Treasury to call bitcoin a decentralized virtual currency. Although its status as a currency is disputed, hence media reports often refer to bitcoin as a cryptocurrency or simply digital currency. Bitcoins are created as a reward for payment processing work in which users offer their computing power to verify and record payments into the public ledger, a process called mining. Individuals or companies engage in mining activities in exchange for transaction fees and newly created bitcoins. Besides mining, bitcoins can be obtained in exchange for fiat money, products, and services. Users can send and receive bitcoins electronically for an optional transaction fee using wallet software on a personal computer, mobile device, or a web application. Bitcoin as a form of payment for products and services has seen growth, and merchants tend to prefer this digital currency because fees are lower than the 2-3% typically imposed by credit card processors. However, Bitcoins still have some drawbacks, as the European Banking Authority has warned that Bitcoin lacks consumer protections. This is because unlike credit cards, any fees are paid by the purchaser, not the vendor. Secondly, Bitcoins can be stolen and chargebacks are impossible. As a result of these, commercial use of bitcoin is currently small compared to its use by speculators, which has fueled price volatility. Also, Bitcoin has been a subject of scrutiny amid concerns that it can be used for illegal activities. In October 2013 the US FBI shut down the Silk Road online black market and seized 144,000 bitcoins worth US$28.5 million at the time. However, unlike other governments of various countries of the world, the US is considered Bitcoin-friendly. In China, for example, buying bitcoins with yuan is subject to restrictions, and bitcoin exchanges are not allowed to hold bank accounts. Moon Bitcoin is a bitcoin faucet with a difference. It is is a unique faucet that pays out in Satoshi, a unit of Bitcoin. It is the only incentive structure with 5 different bonus categories. Each bonus category gives you the ability to double your claim amount. It also pays a 50% referral commission. This makes Moon Bitcoin one of the best opportunities in the Coinpot faucet network. 1) Loyalty bonus — You receive loyalty bonus if you make at least one claim every day. This is the easiest bonus. All you have to do is make a claim every day and you get a bonus. Your bonus percentage will increase every day until it gets to 100% if you don’t miss any day. If you miss a day, it resets back to 1 and you have to walk up to 100% again. 2) Referral bonus — You can take full advantage of this bonus structure if you refer at least 100 people. This does not mean you won’t receive the bonus if you have less than 100 people, you’ll certainly receive your referral bonus even if you have only one referral. In addition to getting 50% of your referral’s claims, you also get a 1% bonus for every person you sign up — up to 100%. This bonus has a ceiling of 100 people, but your referral commission does not. 3) Offer Bonus — To take full advantage of this bonus, do 10 offers and enjoy full advantage of the 100% claim bonus. This bonus has a ceiling of 10 offers. However, most of the offers, like paid surveys are not available to Nigerians. 5) Mining Bonus — Mine on your computer for a 100% bonus depending on your hash rate. There’s one other thing that is absolutely critical in your claim amount. This is true for all the 6 faucets — the number of times you claim can drastically increase your daily claim amount. For example, based on the current claim rate which is published on the Moon Bitcoin site, if you claim every 5 minutes for 4 weeks you get 16,128 satoshi (assuming no referrals or bonus opportunities). 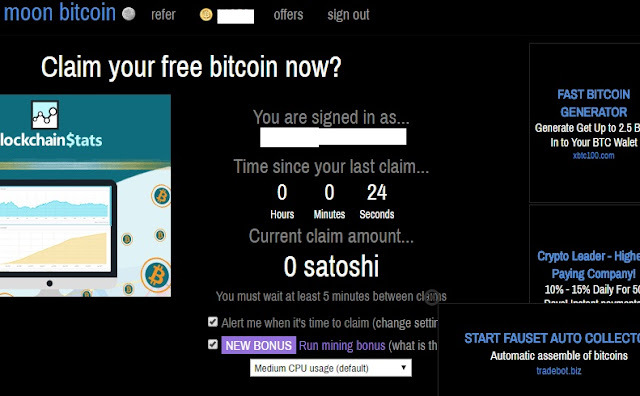 However, if you claim every 4 weeks you get 111 satoshi. Whereas most faucets only allow you to claim once per hour or once per day, this faucet allows you to claim as often or as little as you like. The faucet will gradually fill up - quite quickly initially but it will slow down over time - until you make a claim. So the longer you leave it the more you will be able to claim. You may prefer to claim a smaller amount every 5 minutes, or visit once per day and claim the large amount that has built up while you were away, claiming every 5 minutes, however, will build up your tokens in your Coinpot wallet. These tokens can also be converted to Bitcoins. So, to fast track your earnings, you should claim every 5 minutes. Note that there is a minimum of 5 minutes between claims per account/IP address. The earning rates depend on so many factors and changes from time to time. You can check the faucet website to learn the current earning rate. You can, however, increase your claim amounts by up to 500% by taking advantage of the Daily Loyalty Bonus, Referral Bonus, Offer Bonus, Mystery Bonus and Mining Bonus schemes! How Do You Receive Your Earnings? Starting from 6th July 2017 all payments from Moon Bitcoin are made instantly and directly into your CoinPot wallet. The faucet depends on revenues generated by displaying advertising units on the site. It is this revenue they are sharing with you for visiting the website. As a result, if they detect that you have blocked adverts or they aren't showing up in your web browser then you will not be able to make a faucet claim. If any of the adverts are not showing then there must be something blocking them on your browser/device. This may be an ad-blocking browser plug-in or extension - if so, please disable your ad-blocking browser plugin/software or add the faucet page to the exception list. This faucet website is designed to work on the broadest range of web browsers and devices possible. However, it may be that your browser/device is not supported and you receive an error message when you try to claim. If so, please try a different browser or device to check that this is the problem and fix it. Now, that you have learn how to make easy money online, without any form of capital investment, what are you still waiting for. Sign up with Moon Bitcoin Faucet right away and start making cool cash online just by claiming free bitcoins. Remember, 1 bitcoin is about $8,000 USD. You can make up to 1 bitcoin in a month if you are dedicated. The following faucets are all connected with your Coinpot wallet (if you already have one). So, you are advised to sign up for all of them and claim your free units of bitcoins. They all add up to make you your 1 bitcoin atleast, in one month. Sign up right away. And a telegram bot that gives you bitcoins just for visiting telegram page. Check it out here. Still, here is an investment platform where you can make additional money. Check Westland Storage.